Johann Michael Haydn, the "Salzburg Haydn" has always stood in the shadow of his elder brother Joseph. He might have gone on to higher profile posts but decided to stay in Salzburg, being regarded highly during his lifetime by colleagues such as Mozart but somehow staying under the radar since his death. Leopold Mozart pointed out that he was a bit of a drinker which may account for a certain lack of ambition, but who are we to speculate. The string quintets are scored for two violins, two violas and cello. This results in a fuller sound than the standard quartet, its richness unencumbered by a less agile double-bass, but the pairings of upper and middle instruments inviting a more 'orchestral' approach. This is all pretty amiable music in a 'galant' style which doesn't challenge in terms of real drama or emotional potency, making up for lack of Sturm und Drang with plenty of wit and grace. The whole set is full of gentle delights, though there are particularly attractive contrasts such as the delicate muted and pizzicato Adagio from the Quintet in C major and the symphonic nearly 13 minute duration of the Adagio affettuoso of the Quintet in G major, the bustling Finale of which also deserving of a mention - a shoe-in as the theme for an 18th century sit-com series. There have been one or two other recordings of these works in the past. L'archibudelli had three of them on a Sony Vivarte release which is now out of print, but there is a complete set by Concilium Musicum Wien on the Koch Schwann label which looks like an interesting prospect. I haven't managed to access this for comparison which is annoying for all concerned. 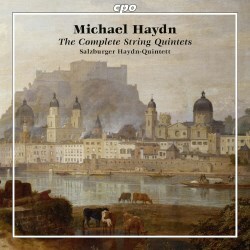 The Salzburger Haydn-Quintett have the arguable advantage of an 'all-Salzburg' environment for their recording, the address of which turns out to be Der Langenhof, which is quite a significant noble palace and one which Haydn would no doubt have known, though no reference is made to it in the booklet. The acoustic is nice and airy, having the kind of chamber-music resonance which would probably have been more familiar to 18th century musicians than grand concert halls. The instruments are not recorded too closely, the perspective more that of a perfect seat in the hall than a seat in the musician's laps. The instruments used are almost all of period vintage and the performing style is in the clean and minimal-vibrato historical sector, though there is in fact a fair bit of vibrato used - just not of the big Romantic kind. I'm guessing these are gut strings used though again, I don't see any indications on this in the booklet. This is a nice set which sits in a thinly-populated section of the Classical repertoire listings. It probably won't rock your world to its foundations, but nor will you regret its acquisition.